Sundays are recovery runs, and last weekend was no different. I go out slow, relaxed, stretching my legs from Saturday’s long run, taking a route with only vaguely known distances, allowing myself to turn around when I feel like it. It’s a low-pressure day, and it’s usually fairly pleasant. I started stiffly, a bit sore from the day before. Just keep at it, I told myself. It takes you about a mile to warm up. Then it gets easier. Not a mile, said a memory. Two kilometers. And suddenly I was back running the loop I used to do in high school, training for a half marathon. Knowing that if I could just make it the first 2K, up to the first left turn, I could make it all the way. I could picture the brilliant snow, the sharp winter sun, the roads that were sloppy because they hadn’t been completely plowed. Street after street of clean suburban houses, in developments too new for mature trees. Crisp air. Footing that was crunchy or icy or wet. I ran that route in bad weather, too, including the dark gray obscurity of a heavy fog, but it’s the bright blinding days that merge together into a single memory of the joy of running. The enveloping happiness of the memory caught me by surprise. My brain doesn’t really do happy memories. Its recollections mostly come with hard stabs of embarrassment or deep pangs of nostalgia and longing. But this memory was good and inviting and warm. The rest of the run went by in a pleasant daze, filled with more details of the past. I could imagine what I used to wear to run: fuzzy green sweatpants, thick socks, double-layered gloves, a close-fitting knit hat. And the same long-sleeved cotton shirt I had on at that very moment. It was altogether the most joy-filled run I’ve had in quite some time. Alas, the spell broke in the last few hundred meters, when I had to dodge around the new posts blocking the path to our neighborhood and my mind switched to thinking up choice names for the members of our HOA board. I bought a new pair of running shoes last week, which means it’s time to retire my old pair. 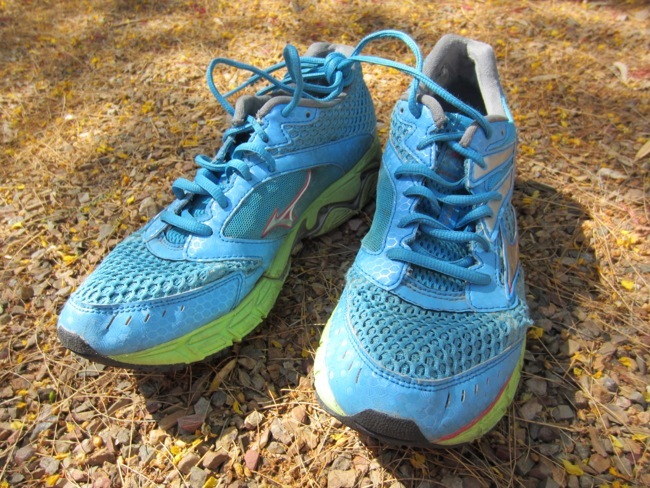 My old running shoes, artfully posed after their final run. Usually, I replace my running shoes on a roughly yearly basis, but I held on to these for more than two years. When the one-year mark came around, they were still holding up well, and it seemed a shame to get rid of them unnecessarily. And then I was pregnant and not running as often or as far, and so it seemed silly to spend money a brand-new pair of shoes that wasn’t going to get much use. And then I was a new parent with barely any time for running, much less shoe shopping, so I stuck with my trusty blue shoes. When I first bought these, I was a bit concerned about their in-your-face blueness, but I quickly grew to like it. There’s no way to say this without sounding a bit ridiculous, but they made my feet feel, well, special. It was oddly motivating, catching bright flashes of blue as I ran. My new shoes are a more sedate white, better for long-term use as everyday sneakers down the line but not quite as exciting different as the blue ones. One of the things I’ve always liked about running is the relatively low barrier to entry. You can’t play ice hockey without skates, or baseball without a bat and ball, but you can head right out the door and start running without any equipment at all. There’s an argument to be made that a good pair of running shoes helps prevent injury (and indeed, it was the increasing twinges in my shins and knees that told me it was time to buy a new pair), but I didn’t buy proper running shoes until I’d been an active participant in the sport for several years. I think my next “official” running gear after that was a fancy set of gloves, designed to keep my Raynaud’s-afflicted hands from going completely numb on cold days. Nowadays, I’m the proud owner of two moisture-wicking T-shirts, one pregnancy-tested sports bra, and an expensive-but-oh-so-very-worth-it running stroller. Plus — and this was particularly helpful in the pre-stroller days — a husband willing to wear a hydration belt on our long runs. Oh, and a stopwatch from Target. So tell me folks, what would you do with a pair of old running shoes? After my last two posts, I thought we might be overdue for a post focusing on good things. I made butternut squash soup yesterday. It was – in my not-so-humble opinion – quite delicious. Making the soup was actually a fairly substantial achievement for me, not because it is hard to make butternut squash soup (it’s not), but because (1) my husband does almost all of the cooking, and (2) this is something I’ve been wanting to do for a long time but was unable to muster up the energy to make the time. This morning’s run was accompanied by beautiful baby song. (And no, that’s not a euphemism for crying. It’s how I refer to the lovely cooing Little Boy makes when he’s happy.) We ran a half-mile further than usual. The eggs in the nest on our backyard patio have hatched into a pair of baby mourning doves. Like most newborn animals, they are simultaneously incredibly ugly and some of the cutest things you’ve ever seen.